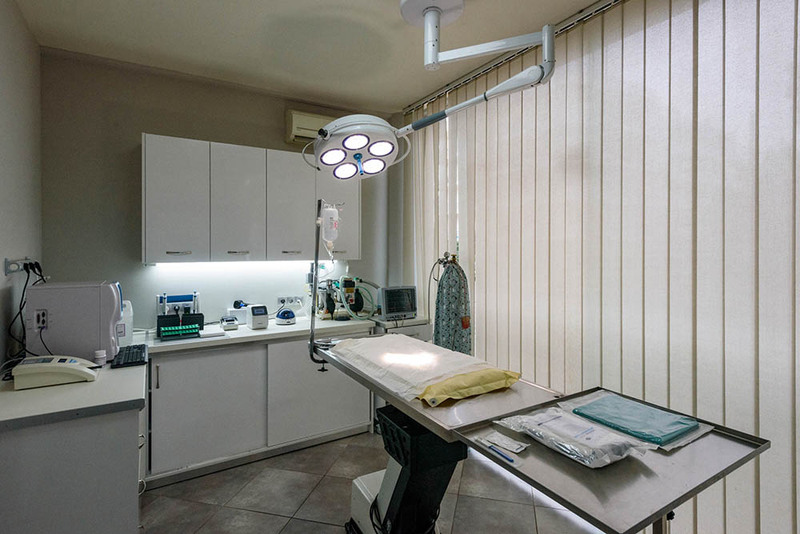 Our surgery is equipped with a unit for inhalation anaesthesia using Isofluran (for quicker and safer recovery after surgery as compared to the old method using Halothan), oxygen, heart beat monitor, pressure, cardiogram, oximetry and temperature monitor. We also have at our disposal a paediatric anaesthesia unit which allows us to undertake surgery on small weight animals. Also available: surgical diathermia for the control of bleeding and more precise incisions as well as a suction device exceptionally useful for procedures within the abdomen where a douche is necessary most of the times. The ophthalmologic examination is necessary for the diagnosis of eye problems that have been caused by damage to the eye or damage of one of the body systems. The inspection includes a neurological examination that checks the integrity of the responsible nerves, direct and indirect ophthalmoscopy, fluorescein eye stain, tear production test. We can also execute surgical procedures of the eye, e.g. in case of entropion, ectropion, blepharophimosis, sty, tumor, dystichiasis, ectopic eyelashes, etc. We also take care of prolapses of the tarsal glands (by repositioning the gland rather than removing it as that leads to dry eyes!) and do surgery on the conjunctiva as well as conjunctival scrapings. 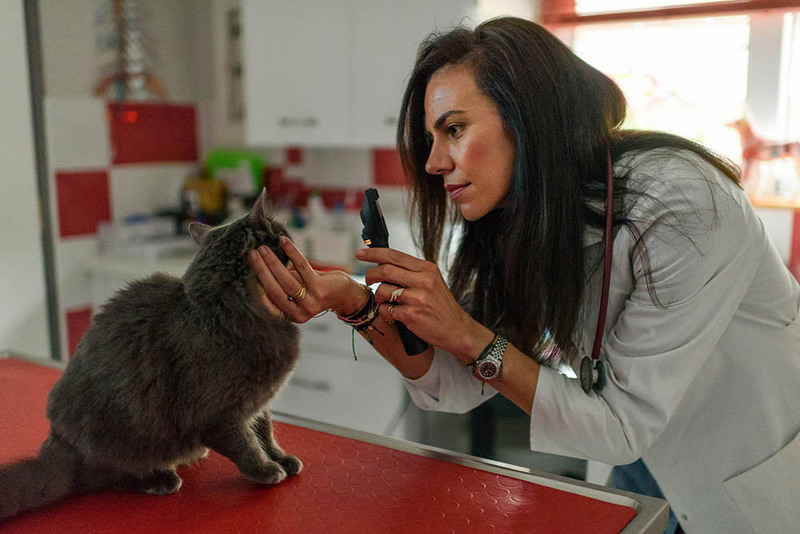 Due to the particular anatomy of the ear nose and throat area of cats and dogs which makes it difficult for the animal owner to check, the control of this particular area is very important. Owners often see the animal tilting the head to one side, shaking or scratching the head, and are at a loss for what to do about it. 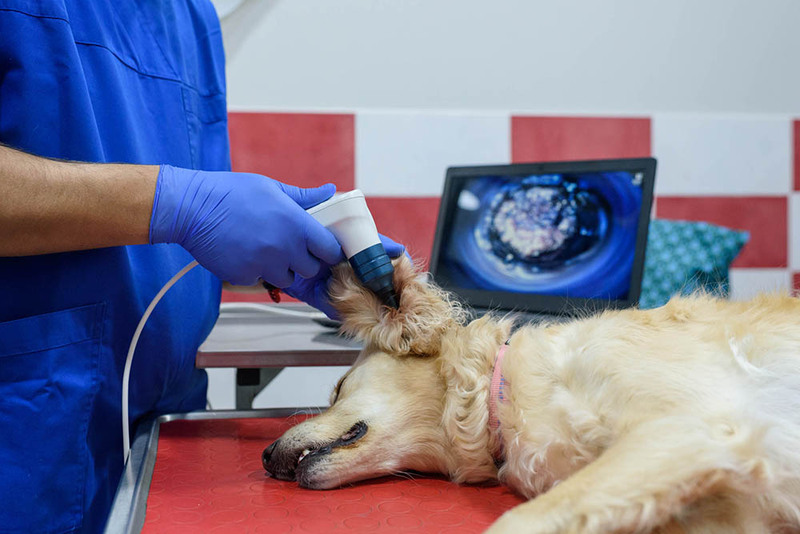 In this case a clinical examination by your vet is especially important, because these symptoms often point to the presence of a foreign body in the auditory canal which in turn can lead to severe otitis. Treating superficially with ear drops is the wrong way. 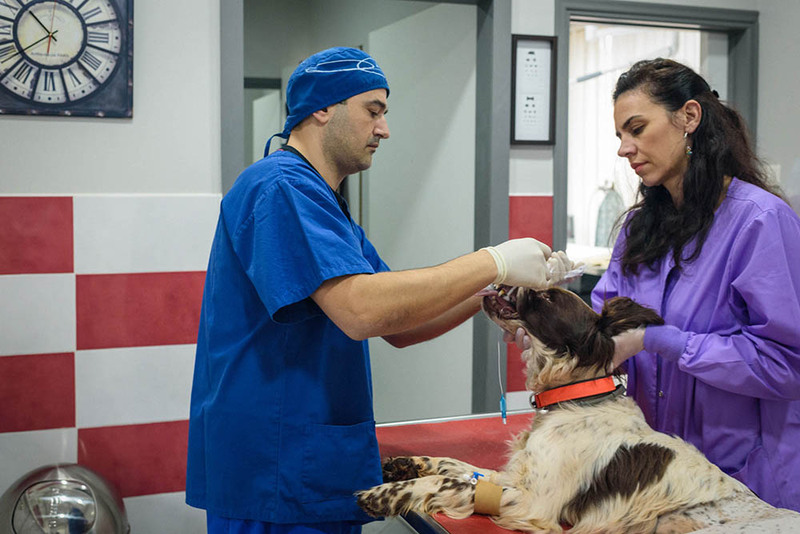 Most times it is necessary to sedate the animal in order to surgically remove the foreign body and clean the auditory canal. Medication can then be applied and will have the best possible effect. 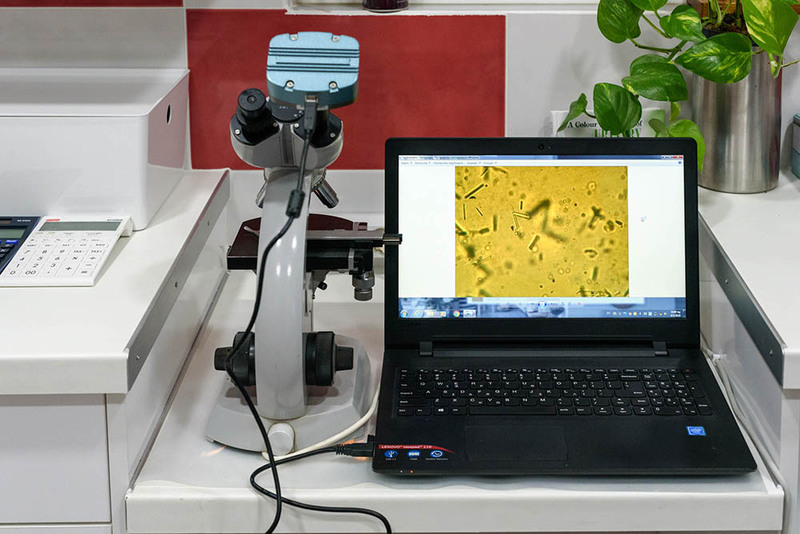 The new Welch Allyn device in our practice allows us to carry out a thorough cleaning with the very best result. One of the problems that we hear about most in our veterinary surgery is bad odour from the pet’s mouth that makes living with the animal unpleasant or even unbearable. When things have reached this point a cleaning tooth treatment is the right solution! Long gone are the times when cleaning of dog’s or cat’s teeth was accomplished by just scraping the teeth. Using our state of the art ultrasonic unit for teeth cleaning and polishing we are able to reach the perfect result. For its own safety the animal is anaesthesised by inhalation method so it cannot by accident swallow anything during the procedure. The ultrasonic unit even cleans spaces between teeth and gums and the following polishing achieves a gleaming and odour neutral result which – in contrast to the old method – will last for months. Unfortunately the area of orthopaedics has long been neglected in our country. But lately it is being realised that orthopaedics constitute a very important sector in daily clinical practice. A vet who is not specialised can easily miss diagnoses like e.g. dislocation of the patella or rupture of the anterior cruciate ligament and the therapy prescribed would be anti-inflammatory treatment which will take away the pain for a few days without, however, improving the condition. 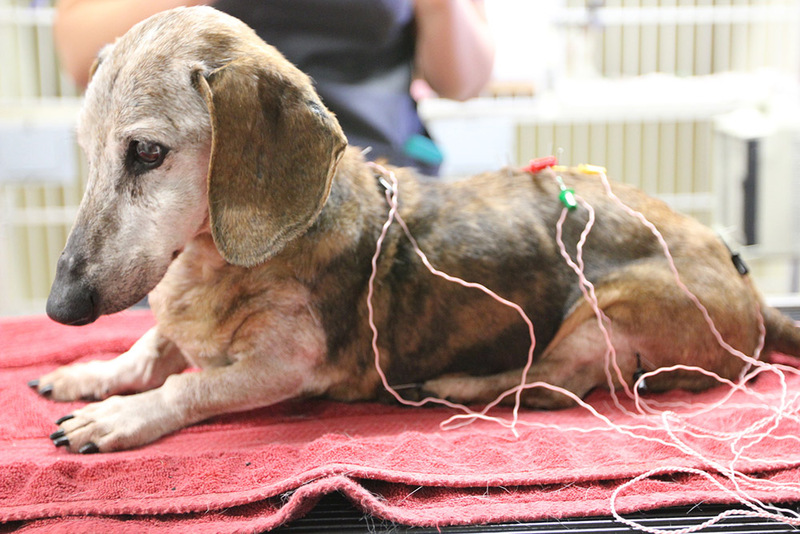 The result is a continuously deteriorating condition until at some point the suggested solution is euthanising the animal – entirely unacceptable when the causes are such as above mentioned – or referring the animal for better treatment to another vet dealing with orthopaedic cases. But it is always much better to treat a problem at its root! In our specialised vet’s surgery we are equipped and prepared to deal with orthopaedic cases correctly. A complete and careful examination of the animal while in motion and in standstill is followed by an orthopaedic examination on the examination table and, if necessary, an X-ray examination. Our state of the art X-ray unit will in most cases give us a clear picture of the animal’s condition which allows us to determine the appropriate therapy. But even in more complicated cases that are related to damage to the nervous system and / or the soft tissue of the spine we have the possibility to arrange for an MRI or a CAT scan (in coordination with the cooperating Athenian clinic). A fracture is no longer a reason to euthanise an animal and with the right treatment a total recovery can be achieved! 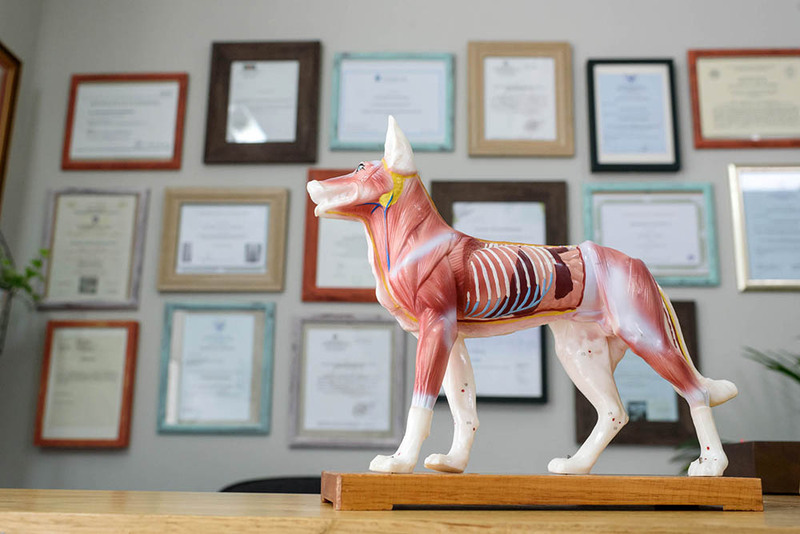 In our veterinary practice we now also use acupuncture to support the treatment especially of orthopedic and neurological but also pathological incidents. Our goal is to reduce as far as possible or even avoid altogether the administration of drugs (cortisone, steroids, anti-inflammatories etc.) through the use of acupuncture! For the past years acupuncture and electro-acupuncture are used with amazing results, especially in rehabilitation and physiotherapy, in clinics all over Europe. The animal patients enjoy the sessions visibly and feel no pain! Each session lasts an average of 15-20 minutes and the pet owner is present throughout it. 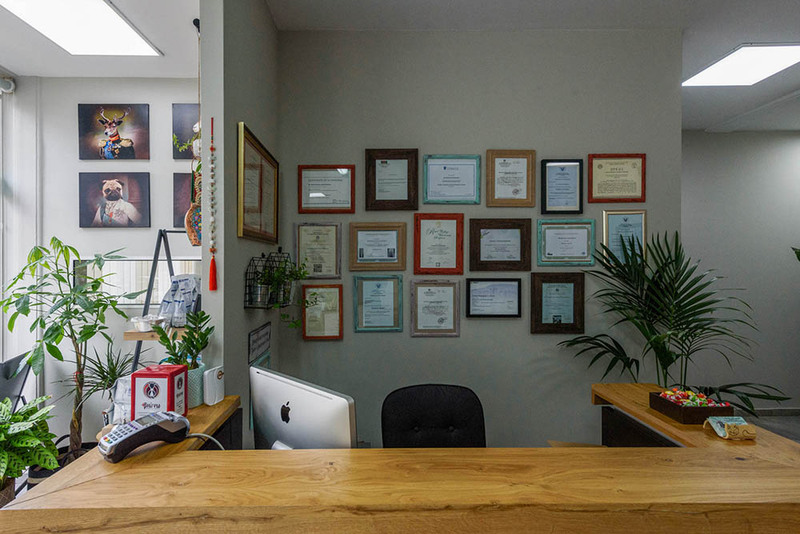 Acupuncture and electro-acupuncture are performed by Eleni Tsoupa, owner of the official pan-European diploma with the grade “very good”. In many cases it is necessary to identify the responsible microorganism or fungus that has infected our pet. The most characteristic example is recurrent otitis which cannot be neutralized by any treatment applied to the animal if we have not first cultured cells taken from the ear in order to identify the responsible microorganism and then be able to decide on the appropriate treatment. In cases of urinary infection and suspected septicemia it is always mandatory to detect the infectious factors. 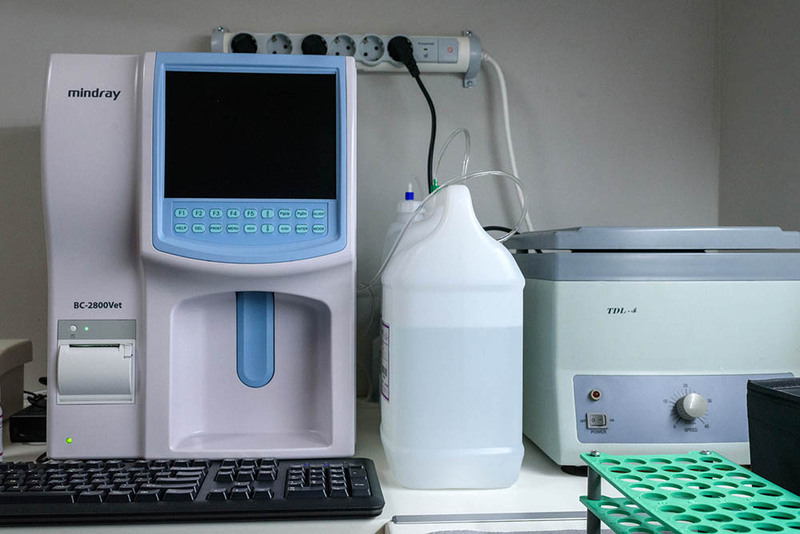 Our practice has an incubator for culturing cells (urine, blood, smear) but we also cooperate with a specialized laboratory in Athens which carries out full scale microbiological examinations! Our modern analysing units supply us with a clear picture about the general condition of the animal within minutes. All blood properties and indicators of the vital organ functions are being tested through a biochemical profile without the time consuming procedure of having to send a blood sample to a laboratory outside the surgery. Often one single treatment is not sufficient and it is necessary to apply an intravenous therapy with regular checks by the vet. 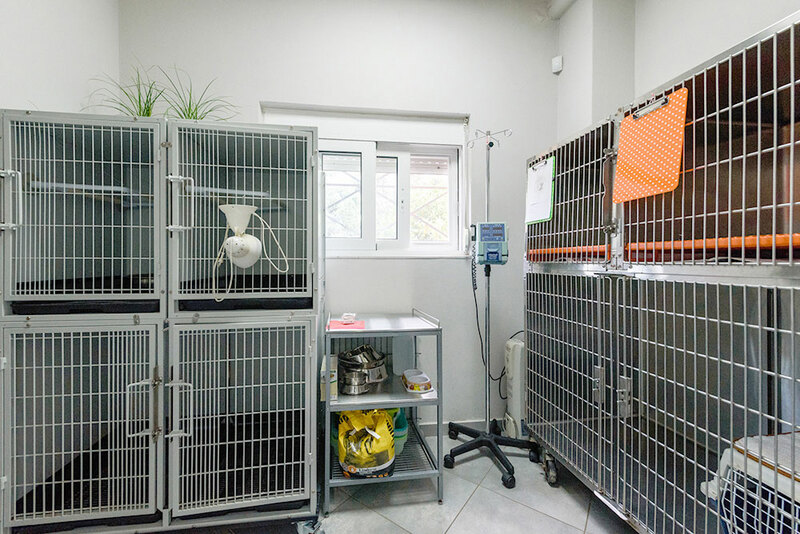 This no longer poses a problem as our practise is equipped with special boxes that will accommodate from a small cat to a large dog of up to 70 kilos. If necessary the animal can be hooked up to a monitor controlling the animal’s heart function, breathing and blood pressure. For heart patients there is also the possibility of printing a cardiogram and supply with oxygen. 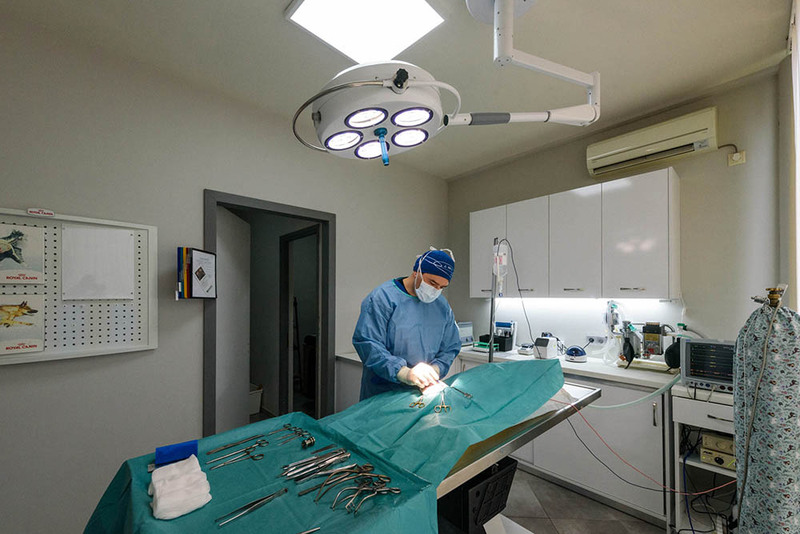 The specialization of our clinic on soft tissue and orthopedic surgery requires a correct and detailed diagnosis and preparation of each case in order to ensure a perfect result. Therefore, we decided to purchase one of the world’s best digital X-ray equipment by German company Protec. 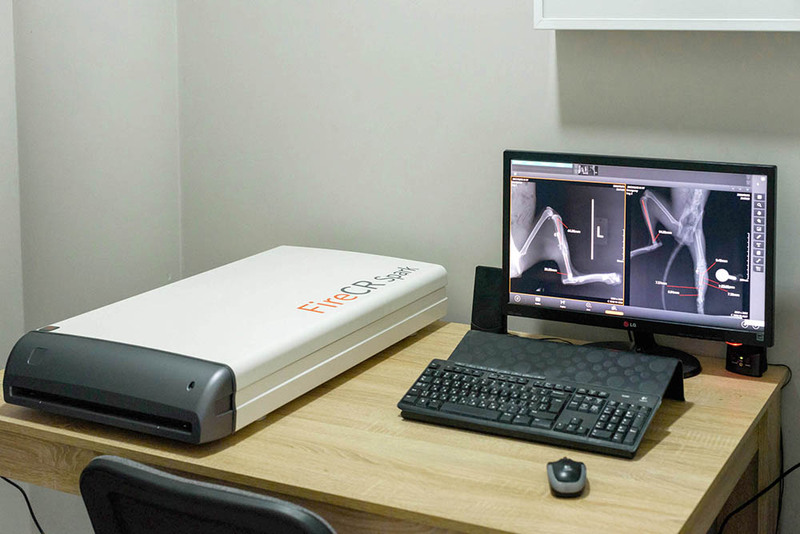 With this digital X-ray machine we are able to obtain X-ray images of astonishing quality and are able to carry out special measurements in each case. We suggest radiological control of your new dog, performed with the pioneering method PennHIP that allows us – already in dogs from the age of three months – an early diagnosis of dysplasia of hip and elbow in order to intervene – if and when necessary – in time and before the further development of this painful illness! In addition, we can use the device to check the spine as well as – for the purpose of diagnosis or monitoring of the development of cancer, of metastasis and many other diseases – the lungs in great detail. 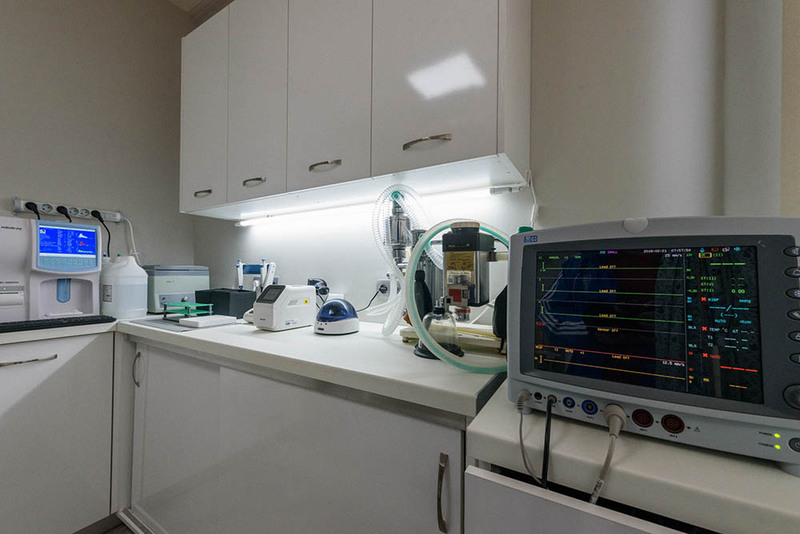 For diseases that need to be diagnosed with CT or MRI we cooperate with the Alpha Vet clinic in Athens, staffed with veterinarians specialized in medical imaging as well as anaesthetists (for cases requiring anesthesia). 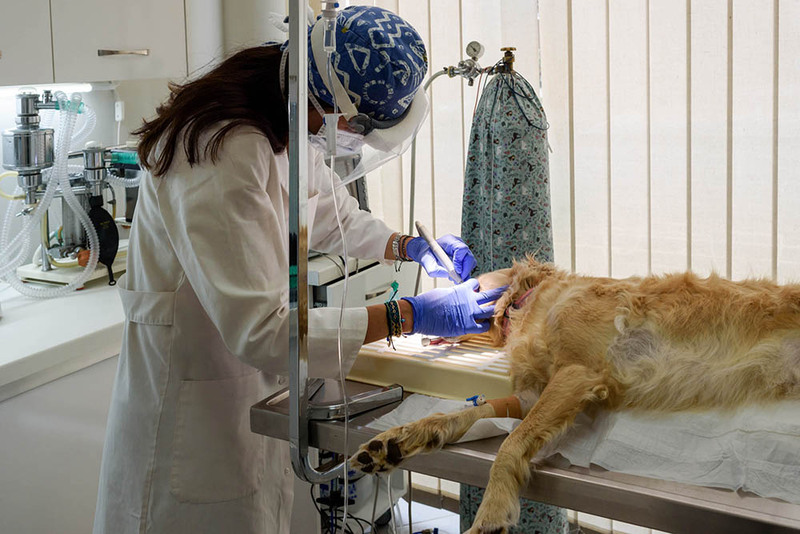 During recovery after a surgical, emergency or routine procedure the animals are being monitored in our recovery room and complications during this phase as thus avoided. The animal can wake up in a quiet environment and traumata due to stress during awakening are prevented. Use medication ONLY in accordance with your vet’s advice! All vaccines are of the latest scientific technology and cover all treatable diseases!